Des Comley with Sage (2) and Craig Latta and other Secret Harbour residents. 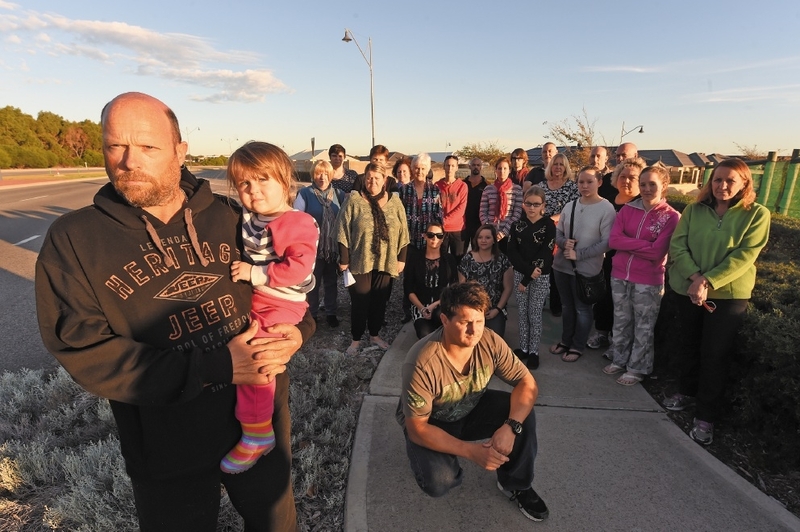 LITTER, odour, anti-social behaviour and “ugly” golden arches are some of the grievances aired by Secret Harbour residents protesting against a McDonald’s outlet that has been approved for the area. Residents said about eight to 10 units on Oneida Road looked out at vacant land, but would soon have views of car parks and a fast food outlet. There are concerns young and/or drunk people will congregate in the vicinity because the outlet will be open 24 hours a day. They are also concerned with increased traffic and a possible reduction in house values. Catherine Comley said residents wanted the restaurant moved across the road or closer to a nearby service station. She said residents did not get enough notice that a |McDonald’s was planned. Ms Comley met McDonald’s representatives this week and did a letter drop. Residents have also lobbied politicians and are planning a petition. A Facebook page, Move Maccas Secret Harbour, has more than 200 members. City of Rockingham Mayor Barry Sammels said a traffic impact assessment submitted in support of the proposal demonstrated the surrounding roads could sustain traffic generated by the proposal. “The perception of the visual amenity of signage is entirely a matter of personal taste and … the city cannot comment on the differing opinions about the proposed sign,” he said. Cr Sammels said the proposed development was endorsed at the April 28 council meeting and it went to the Metro South West JDAP meeting on May 7. “This proposal was not advertised because it was consistent with the indicative development plan adopted in 2009 for the Secret Harbour Town Centre,” he said.